Olympic arrived at Belfast on 12th January 1917 for a three months’ reﬁt, which included fitting six 6-in guns, with 40 Royal Naval ratings allocated. Two guns were mounted on the fo’castle, two in the forward well deck and two aft on the poop deck. 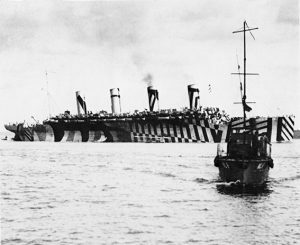 She had a new dazzle cam­ou­flage scheme designed by the war artist Norman Wilkinson, one of several patterns she sported during the war. During the over­­haul, Captain Hayes was given temporary command of Celtic. 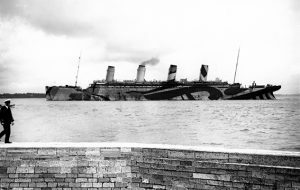 Under Captain Hayes, Celtic sailed from Liv­er­pool for New York on 14th February 1918, but on 15th Feb­ruary she hit a mine laid by U-80, off the Isle of Man. Seven­teen crew were killed: sur­viv­ors were taken off by the railway ferry Slieve Bawn and taken to Holyhead. Despite a 30-foot hole in her side, Celtic was towed to Liverpool and then repaired at Belfast. She was back in service by the end of April. Following the aborted voyage on Celtic, Captain Hayes com­manded Adriatic on one voyage to New York then returned to command of Olympic. On 4th April 1918 Olympic was re-commissioned. She was due to sail from Greenock for Halifax with all cabins full and over 2,000 passengers. However she was held for several days waiting for a politi­cal dele­gation headed by Arthur J. Balfour, British Foreign Sec­re­­tary and head of the British Mission to the United States. On 2nd June Mr Balfour and his mission boarded Olympic at Halifax for the return voyage. Captain Hayes was later awarded the CMG for this duty.